, an eminent, but unfortunate statesman, of an ancient family, the son of sir William Wentworth of Yorkshire, was born April 13, 1593, in Chancery-lane, London, at the house of his maternal grandfather, a barrister of Lincoln’s-inn. 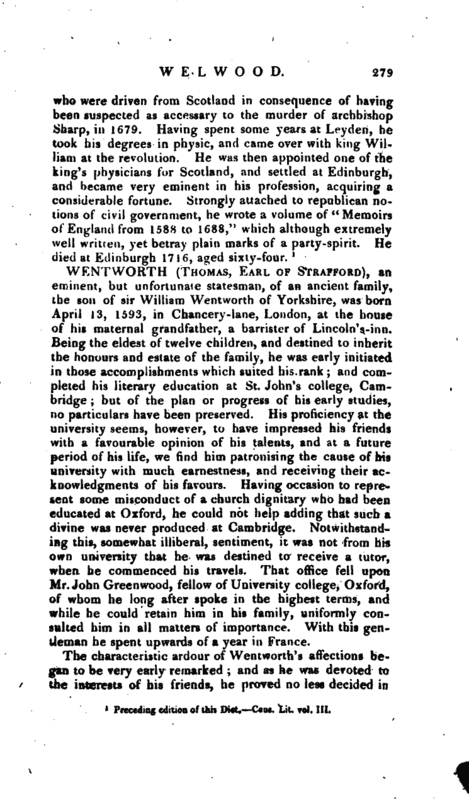 Being the eldest of twelve children, and destined to inherit the honours and estate of the family, he was early initiated in those accomplishments which suited his rank; and completed his literary education at St. John’s college, Cambridge; but of the plan or progress of his early studies, no particulars have been preserved. His proficiency at the university seems, however, to have impressed his friends with a favourable opinion of his talents, and at a future period of his life, we find him patronising the cause of his university with much earnestness, and receiving their acknowledgments of his favours. Having occasion to represent some misconduct of a church dignitary who had been educated at Oxford, he could not help adding that such a divine was never produced at Cambridge. Notwithstanding this, somewhat illiberal, sentiment, it was not from his own university that he was destined to receive a tutor, when he commenced his travels. That office fell upon Mr. John Greenwood, fellow of University college, Oxford, of whom he long after spoke in the highest terms, and while he could retain him in his family, uniformly consulted him in all matters of importance. With this gentleman he spent upwards of a year in France. The characteristic ardour of Wentworth’s affections began to be very early remarked; and as he was devoted to the interests of his friends, he proved no less decided in | the prosecution of his enemies. Habituated to the indulgencies of a plentiful fortune, and unaccustomed to opposition, he was choleric in the extreme, and the sudden violence of his resentment was apt to transport him beyond all bounds of discretion. Yet this defect was in a great measure atoned for by the manliness and candour with which it was acknowledged. When his friends, who perceived how detrimental it must prove to his future welfare, frequently admonished him of it, their remonstrances were always taken in good part. He endeavoured, by watching still more anxiously his infirmity, to convince them of his earnest desire to amend: and his attachment was increased towards those who advised him with sincerity and freedom. Sir George Radcliffe, the most intimate of his friends, informs us, that he never gained more upon his trust and affection than when he told him of his weaknesses. On his return from abroad Wentworth appeared at court, and was knighted by king James, and about the same time married Margaret Clifford, the eldest daughter of the earl of Cumherland. In the following year (1614) he succeeded, by the death of his father, to a baronetcy, and an estate of 6000l. a year. His time was now occupied with the pleasures and cares which naturally attend a country gentleman of distinction, but he seems to have quickly attracted the notice of his county and of government; for he had not above a year enjoyed his inheritance when he was sworn into the commission of the peace, and nominated by sir John Savile to succeed him as custos rotulorum, or keeper of the archives, for the West Riding of Yorkshire, an office bestowed only on gentlemen of the first consideration. 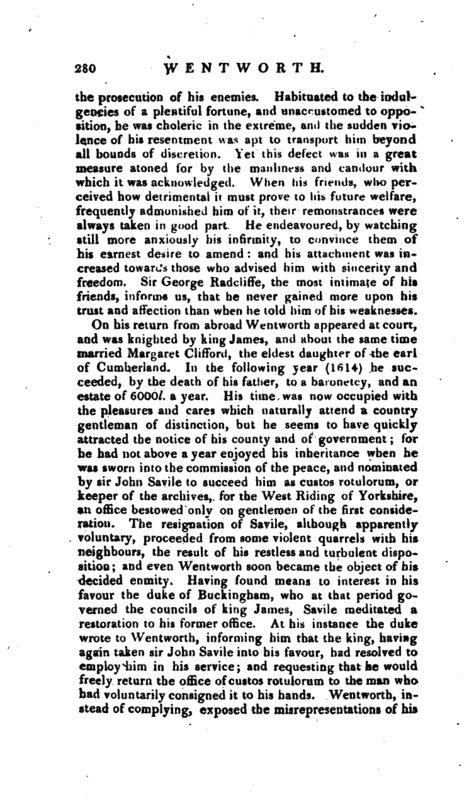 The resignation of Savile, although apparently voluntary, proceeded from some violent quarrels with his neighbours, the result of his restless and turbulent disposition; and even Wentworth soon became the object of his decided enmity. Having found means to interest in his favour the duke of Buckingham, who at that period governed the councils of king James, Savile meditated a restoration to his former office. At his instance the duke wrote to Wentworth, informing him that the king, having again taken sir John Savile into his favour, had resolved to employ him in his service; and requesting that he would freely return the office of custos rotulorum to the man who had voluntarily consigned it to his hands. 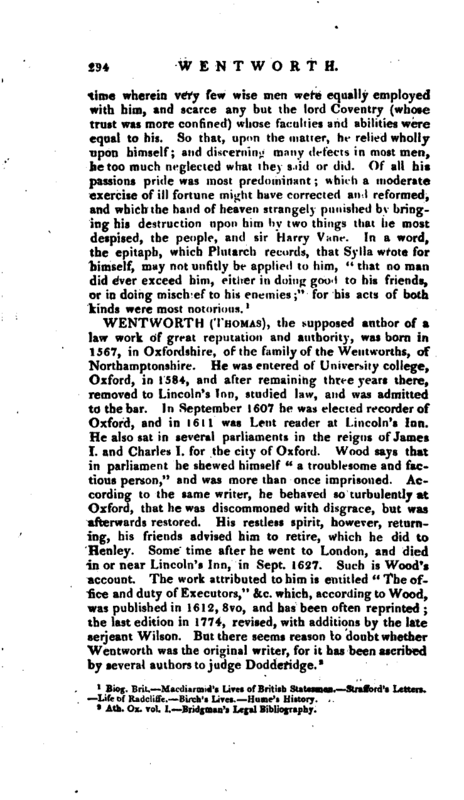 Wentworth, instead of complying, exposed the misrepresentations of his | antagonist; shewed that his resignation had been wnaog from him by necessity, and indicated his intention of coming to London to make good his assertion. The duke, though very regardless of giving offence in the pursuit of his purposes, did not, however, judge this a sufficient occasion to risk the displeasure of the Yorkshire gentlemen. He therefore replied with much seeming cordiality, assuring Wentworth that his former letter proceeded entirely from misinformation, and that the king had only consented to dispense with his service from the idea that he himself desired an opportunity to resign. This incident is chiefly remarkable as it laid the first foundation of that animosity with Buckingham which was the cause of many questionable circumstances in the conduct of Wentworth. The duke was not of a disposition to forget even the slightest opposition to his will; and Wentworth was not a man to be in*­jured with impunity. A parliament having been summoned to meet in 1621, Wentworth was returned for the county of York, and appeared in the House of Commons at a period when an unusual combination of circumstances drew forth a singular display of address, intrepidity, and eloquence. The part which Wentwortb acted during the two sessions of this parliament, was circumspect and moderate. We indeed find him active in promoting the expulsion of a member who had spoken with much irreverence of a bill for repressing those licentious sports on the sabbath, which the royal proclamation had authorised; and when the king hazarded the assertion that the privileges of the commons were enjoyed by his permission, and their deliberations controulable by his authority, Wentworth urged the House to declare explicitly that their privileges were their right and inheritance, and the direction of their proceedings subject solely to their own cognizance. The abrupt dissolution of the parliament, he followed with expressions of regret and apprehension. Yet his language towards the court was always respectful, and his eloquence more frequently employed to moderate than to excite the zeal of his colleagues. Two years after, in 1624, another parliament was called, in which Wentworth, again returned, appears to have refrained from any particular activity. On the accession, however, of Charles I. he took his station among the most conspicuous of the party in opposition to the measures of the court. But this did not last long. | Buckingham found means to conciliate him by expressions of esteem, and promises of future favour. These overtures were not unacceptable to Wentworth. 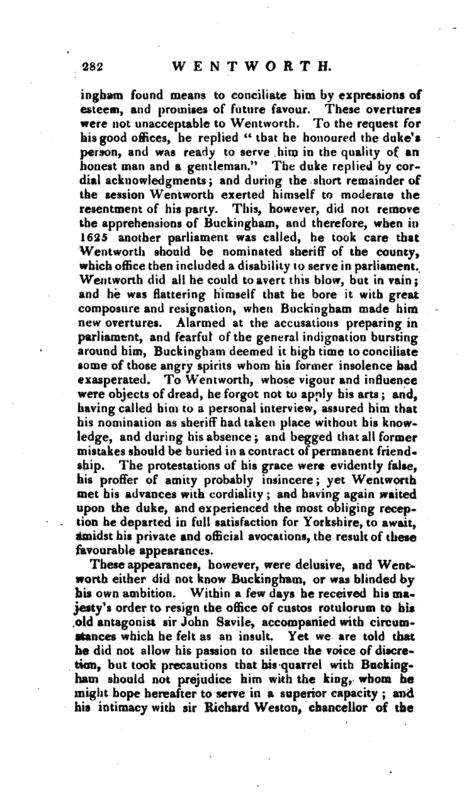 To the request for his good offices, he replied “that he honoured the duke’s person, and was ready to serve him in the quality of an honest man and a gentleman.” The duke replied by cordial acknowledgments; and during the short remainder of the session Wentworth exerted himself to moderate the resentment of his party. This, however, did not remove the apprehensions of Buckingham, and therefore, when in 1625 another parliament was called, he took care that Wentworth should be nominated sheriff of the county, which office then included a disability to serve in parliament. Wentworth did all he could to avert this blow, but in vain; and he was flattering himself that he bore it with great composure and resignation, when Buckingham made him new overtures. Alarmed at the accusations preparing in parliament, and fearful of the general indignation bursting around him, Buckingham deemed it high time to conciliate some of those angry spirits whom his former insolence had exasperated. To Wentworth, whose vigour and influence were objects of dread, he forgot not to apply his arts; and, having called him to a personal interview, assured him that his nomination as sheriff had taken place without his knowledge, and during his absence; and begged thai all former mistakes should be buried in a contract of permanent friendship. 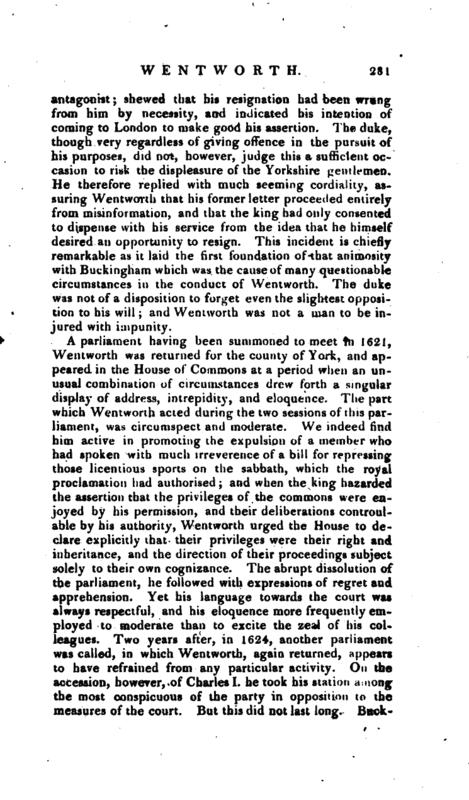 The protestations of his grace were evidently false, his proffer of amity probably insincere; yet Wentworth met his advances with cordiality; and having again waited upon the duke, and experienced the most obliging reception he departed in full satisfaction for Yorkshire, to await, amidst his private and official avocations, the result of these favourable appearances. These appearances, however, were delusive, and Wentworth either did not know Buckingham, or was blinded by his own ambition. Within a few days he received his majesty’s order to resign the office of custos rotulorum to his old antagonist sir John Savile, accompanied with circumstances which he felt as an insult. 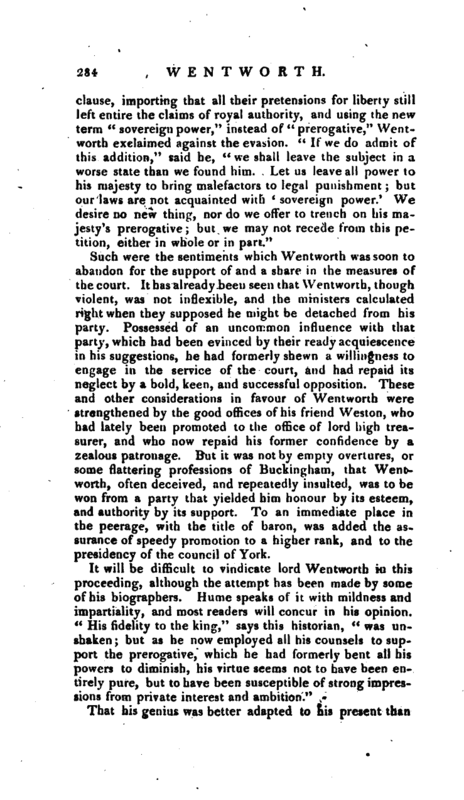 Yet we are told that he did not allow his passion to silence the voice of discretion, but took precautions that his quarrel with Buckingham should not prejudice him with the king, whom he might hope hereafter to serve in a superior capacity; and his intimacy with sir Richard Weston, chancellor of the | Exchequer, furnished him with the means of executing these intentions. He particularly solicits his friend, at some favourable opportunity, to represent to his majesty the estimation in which he was held by the late king, his ardent attachment to his present sovereign, his unfeigned grief at the apprehension of his displeasure, and his eager desire to shew his affection and zeal by future services. To those friends who were acquainted with all this, it seemed strange and incomprehensible, when they saw Wentworth, not many months afterwards, boldly stand forward as the assertor of the popular rights, and resist the crown in its most favourite exertions of power. But this measure, says his late biographer, whom we principally follow, though to them it might bear the aspect of imprudence and temerity, was dictated by a profound appreciation of the intervening circumstances. 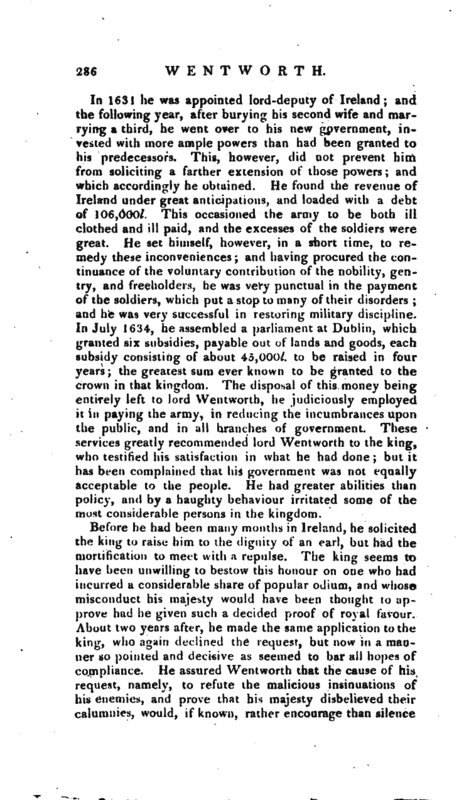 Whatever may be in this, it is certain that when the king endeavoured to raise a loan without the aid of parliament, Wentworth, whether, as his biographer says, animated by patriotism, or led by a skilful ambition, refused to pay the demanded contribution; and having, before the privy council, persisted in justifying his conduct, he was first thrown into prison, and afterwards, as a mitigated punishment, sent to Dartford, in Kent, with a prohibition logo above two miles from the town. This confinement did not last long, for on the calling of a new parliament in 1628, he was released, and re-elected for the county of York. Such were the sentiments which Wentworth was soon to abandon for the support of and a share in the measures of the court. Jt has already been seen that Wentworth, though violent, was not inflexible, and the ministers calculated right when they supposed he might be detached from his party. Possessed of an uncommon influence with that party, which had been evinced by their ready acquiescence in his suggestions, he had formerly shewn a willingness to engage in the service of the court, and had repaid its neglect by a bold, keen, and successful opposition. These and other considerations in favour of Wentworth were strengthened by the good offices of his friend Weston, who had lately been promoted to the office of lord high treasurer, and who now repaid his former confidence by a zealous patronage. But it was not by empty overtures, or some flattering professions of Buckingham, that Wenbworth, often deceived, and repeatedly insulted, was to be won from a party that yielded him honour by its esteem, and authority by its support. To an immediate place in the peerage, with the title of baron, was added the assurance of speedy promotion to a higher rank, and to the presidency of the council of York. It will be difficult to vindicate lord Wentworth in this proceeding, although the attempt has been made by some of his biographers. Hume speaks of it with mildness and impartiality, and most readers will concur in his opinion. !< His fidelity to the king,“says this historian,” was unshaken; but as he now employed all his counsels to support the prerogative, which he had formerly bent all his powers to diminish, his virtue seems not to have been entirely pure, but to have been susceptible of strong impressions from private interest and ambition." That his genius was better adapted to his present than | his former situation, and that, in fact, he had hitherto been only acting a part ^ soon appeared from his conduct as president of the council of York. The council of York, or of the North, was peculiarly suited to the genius of an absolute monarchy. The same forms of administering justice‘ had prevailed in the four northern counties, as in other parts of England, till the thirty-first year of Henry VIII. 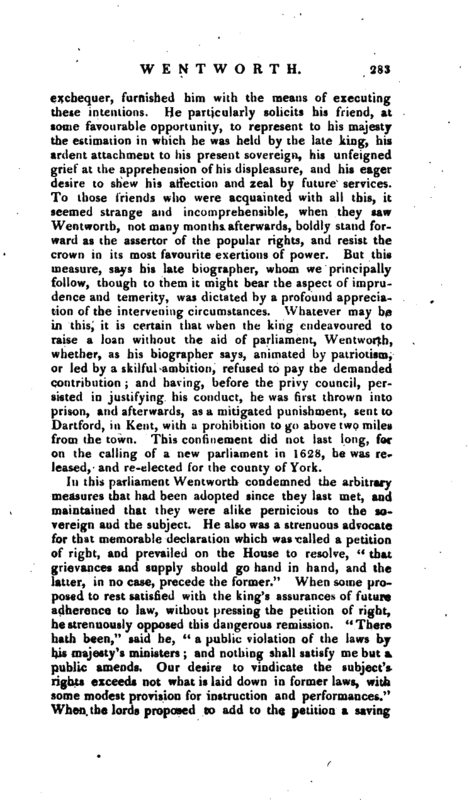 ; when an insurrection, attended with much bloodshed and disorder, induced that monarch to grant a commission of oyer and terminer to the archbishop of York, with some lawyers and gentlemen of that county, for the purpose of investigating the grounds of those outrages, and bringing the malefactors to punishment according to the laws of the land. The good effects of the commission in restoring tranquillity, caused its duration to be prolonged; and, on the re-appearance of commotions in those quarters, it was, in succeeding times, frequently renewed. An abuse gradually arose out of a simple expedient. Elizabeth, and after her, James, found it convenient to alter the tenour of the commission, to increase the sphere of its jurisdiction, and to augment its circumscribed legal authority by certain discretionary powers. 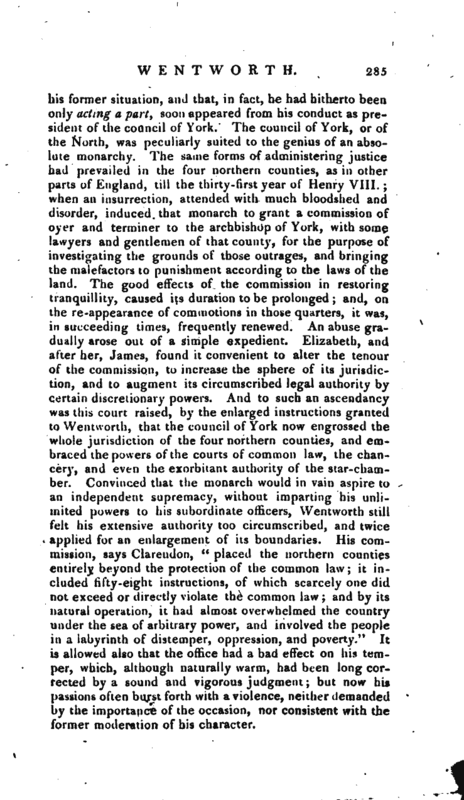 And to such an ascendancy was this court raised, by the enlarged instructions granted to Wentworth, that the council of York now engrossed the whole jurisdiction of the four northern counties, and embraced the powers of the courts of common law, the chancery, and even the exorbitant authority of the star-chamber. Convinced that the monarch would in vain aspire to an independent supremacy, without imparting his unlimited powers to his subordinate officers, Wentworth still felt his extensive authority too circumscribed, and twice applied for an enlargement of its boundaries. His commission, says Clarendon, “placed the northern counties entirely beyond the protection of the common law; it included fifty-eight instructions, of which scarcely one did not exceed or directly violate the common law; and by its natural operation, it had almost overwhelmed the country under the sea of arbitrary power, and involved the people in a labyrinth of distemper, oppression, and poverty.” It is allowed also that the office had a bad effect on his temper, which, although naturally warm, had been long corrected by a sound and vigorous judgment; but now his passions often burst forth with a violence, neither demanded by the importance of the occasion, nor consistent with the former moderation of his character. | In 1631 he was appointed lord-deputy of Ireland; and the following year, after burying his second wife and marrying a third, he went over to his new government, invested with more ample powers than had been granted to his predecessors. This, however, did not prevent him from soliciting a farther extension of those powers; and which accordingly he obtained. He found the revenue of Ireland under great anticipations, and loaded with a debt of 106,000l. This occasioned the army to be both ill clothed and ill paid, and the excesses of the soldiers were great. He set himself, however, in a short time, to remedy these inconveniences; and having procured the continuance of the voluntary contribution of the nobility, gentry, and freeholders, he was very punctual in the payment of the soldiers, which put a stop to many of their’disorders; and he was very successful in restoring military discipline. In July 1634, he assembled a parliament at Dublin, which granted six subsidies, payable out of lands and goods, each subsidy consisting of about 45, Ooo/. to be raised in four years; the greatest sum ever known to be granted to the crown in that kingdom. The disposal of this money being entirely left to lord Wentworth, he judiciously employed it in paying the army, in reducing the incumbrances upon the public, and in all branches of government. These services greatly recommended lord Wentworth to the king, who testified his satisfaction in what he had done; but it has been complained that his government was not equally acceptable to the people. He had greater abilities than policy, and by a haQghty behaviour irritated some of the most considerable persons in the kingdom. Before he had been many months in Ireland, he solicited the king to raise him to the dignity of an earl, but had the mortification to meet with a repulse. The king seems to have been unwilling to bestow this honour on one who had incurred a considerable share of popular odium, and whose misconduct his majesty would have been thought to approve had he given such a decided proof of royal favour. About two years after, he made the same application to the king, who again declined the request, but now in a manner so pointed and decisive as seemed to bar all hopes of compliance. He assured Wentworth that the cause of his request, namely, to refute the malicious insinuations of his enemies, and prove that his majesty disbelieved their calumnies, would, if known, rather encourage than silence | his enemies, who would become more bold and dangerous when they found that they were feared. But this did not reconcile Wentworth to the disappointment, which he continued to feel bitterly, until the king sending for him in September 1639, he was in January following raised to his long-desired dignity, the earldom of Stratford. At the same time he was raised from the title of deputy to that of lord-lieutenant of Ireland, and was likewise made a knight of the garter. On his return to Ireland, where he remained about a fortnight, he sat in parliament, had four subsidies granted, appointed a council of war, and gave orders to levy 8000 men, which with 200O foot, and 1000 horse, which was the standing army in Ireland, and 5000 horse to be joined with them, were to be sent into Scotland, under his lordship’s command, to reduce that country to obedience. He then embarked for England, although at that time labouring under serious indisposition. On his recovery, he was made lieutenant-general of the English forces in the North, but the king having agreed to a truce with the Scots, his lordship had business of a more serious nature to attend to. On Nov. 3, 1640, the parliament, called afterwards the long parliament, met, and was composed of men who were determined to redress what they called abuses, by their own authority. In this design, the only dangerous obstacle which they feared to encounter, was the vigour and talents of Strafford. While the popular leaders detested him as a traitor to their cause, and the Scots as the implacable enemy of their nation, all equally dreaded those abilities which had laid Ireland prostrate at his feet, and which had almost inspired the royal counsels with decision. While he continued at the head of an army, there was no security that he might not, by some sudden movement, confound and crush their projects; and nothing seemed, therefore, possible to be achieved, till his destruction was first accomplished. 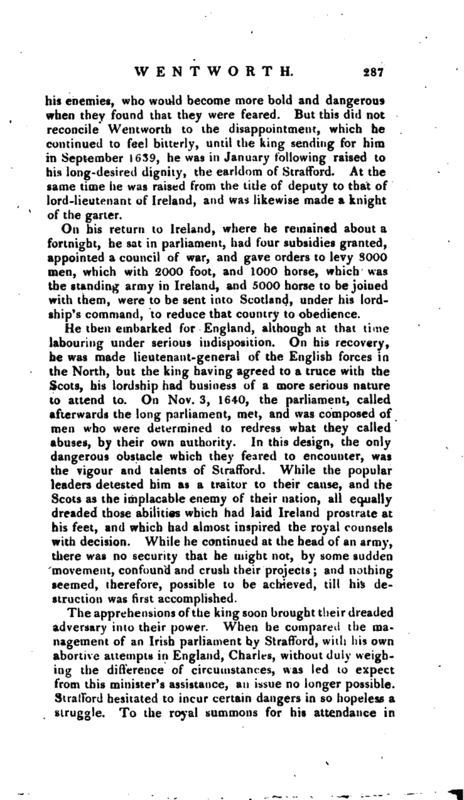 Strafford at length prepared to obey these repeated mandates; and having discovered a traitorous correspondence, in which his enemy Savile and some other lords had invited the Scots to invade England, he resolved to anticipate and confound his adversaries by an accusation of these popular leaders. 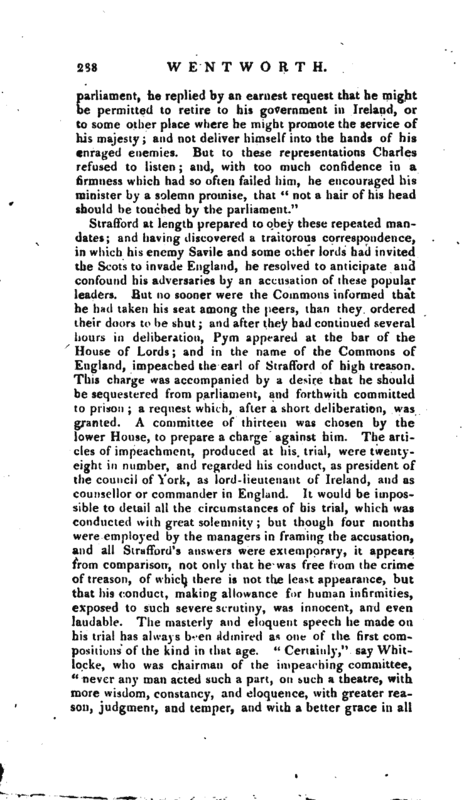 But no sooner were the Commons informed that he had taken his seat among the peers, than they ordered their doors to be shut; and after they had continued several hours in deliberation, Pyrn appeared at the bar of the House of Lords; and in the name of the Commons of England, impeached the earl of Strafford of high treason. This charge was accompanied by a desire that he should be sequestered from parliament, and forthwith committed to prison; a request which, after a short deliberation, was granted. A committee of thirteen was chosen by the lower House, to prepare a charge against him. The articles of impeachment, produced at his trial, were twentyeight in number, and regarded his conduct, as president of the council of York, as lord-lieutenant of Ireland, and as counsellor or commander in England. 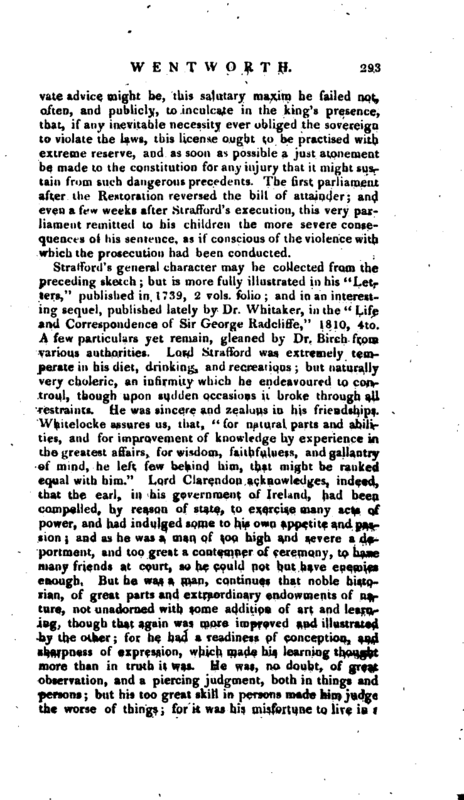 It would be impossible to detail all the circumstances of his trial, which was conducted with great solemnity; but though four months were employed by the managers in framing the accusation, and all Strafford’s answers were extemporary, it appears from comparison, not only that he was free from the crime of treason, of which there is not the least appearance, but that his conduct, making allowance for human infirmities, exposed to such severe scrutiny, was innocent, and even laudable. The masterly and eloquent speech he made on his trial has always been admired as one of the first compositions of the kind in that age. “Certainly,” say Whitlocke, who was chairman of the impeaching committee, “never any man acted such a part, on such a theatre, with more wisdom, constancy, and eloquence, with greater reason, judgment, and temper, and with a better grace in all | his words and actions, than did this great and excellent person; and he moved the hearts of all his auditors, some few excepted, to remorse and pity.” But his fate was determined upon. His enemies resolved to hasten it, at the expence of justice, by adopting a proceeding, which overstepped the established forms and maxims of law, and against which innocence could form no protection. Dreading the decision of the lords, if the charges and evidence were to be weighed by the received rules, they resolved to proceed by a bill of attainder: and to enact that Strafford was guilty of high treason, and had incurred its punishment. The commons endeavoured to veil the infamy of this proceeding, by an attempt, not less infamous, and still more absurd, to satisfy the legal rules of evidence. 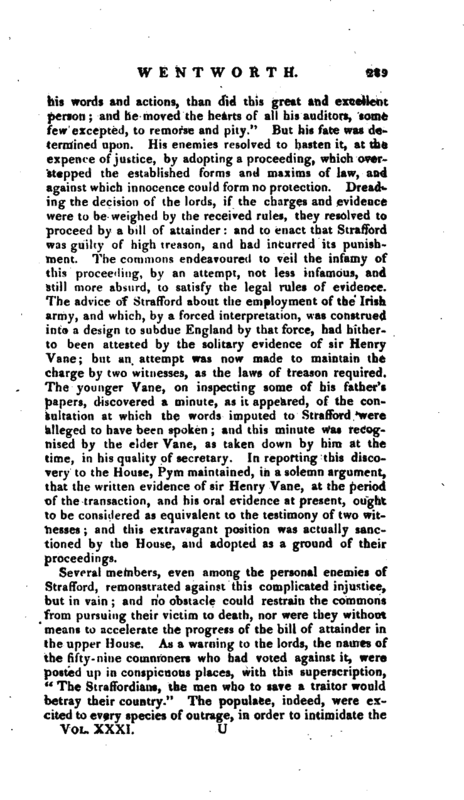 The advice of Strafford about the employment of the Irish army, and which, by a forced interpretation, was construed into a design to subdue England by that force, had hitherto been attested by the solitary evidence of sir Henry Vane; but an attempt was now made to maintain the charge by two witnesses, as the laws of treason required. The younger Vane, on inspecting some of jiis father’s papers, discovered a minute, as it appeared, of the consultation at which the words imputed to Strafford were alleged to have been spoken; and this minute was recognised by the elder Vane, as taken down by him at the time, in his quality of secretary. In reporting this discovery to the House, Pym maintained, in a solemn argument, that the written evidence of sir Henry Vane, at the period of the transaction, and his oral evidence at present, ought to be considered as equivalent to the testimony of two witnesses; and this extravagant position was actually sanctioned by the House, and adopted as a ground of their proceedings. 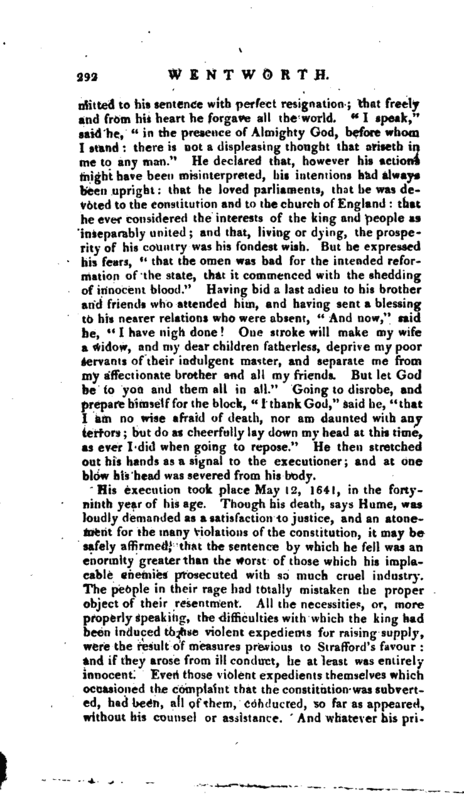 Strafford, hearing of the king’s irresolution and anxiety, wrote a letter, in which he entreated his majesty, for the sake of public peace, to put an end to his unfortunate, however innocent life, and to quiet the tumultuous people by granting them the request for which they were so importunate. The magnanimity of this letter made little impression on the courtiers who surrounded the king; they now urged, that the full consent of Strafford to his own death absolved his majesty from every scruple of conscience; and after much anxiety and doubt, the king granted a commission to four noblemen to give the royal assent, in his name, to the bill, a measure ultimately as pernicious to Charles as it was now to Strafford, for with it was coupled his assent to the bill which rendered, this parliament perpetual. But so much was his majesty at this time under the presence of terror, or regard for Strafford, that he did not perceive that this last billwas of fatal consequence to himself. In fact, in comparison with the bill f attainder, this concession, made no figure in his eyes. A circumstance, says Hume, which, if it lessen our idea of his resolution or penetration, serves to prove the integrity of his heart, and the goodness of his disposition. It is indeed certain, that strong compunction for his consent to Strafford’s execution attended this, unfortunate prince during the remainder of his life; and even at his own fatal end, the memory ojf this guilt, with great sorrow and remorse, recurred upon him. Strafford, notwithstanding his voluntary surrender of his | life, in the letter he wrote to the king, was not quite prepared to expect so sudden a dereliction by his sovereign* When secretary Carleton waited on him with the intelligence, and stated his own consent as the circumstance that had chiefly moved the king, the astonished prisoner inquired it’ his majesty had indeed sanctioned the bill? and when assured of the fatal truth, he exclaimed: “Put not your trust in princes, nor in the sons of men; for in them there is no salvation.” Resuming, however, his accustomed fortitude, he began now to prepare for his fate, and employed the short interval of three days, which was allowed him, in the concerns of his friends and his family. He humbly petitioned the House of Lords to have compassion on his innocent children. He wrote his last instructions to his eldest son, exhorting him to be obedient and grateful to those entrusted with his education; to be sincere and faiiliful towards his sovereign, if he should ever be called into public service; and, as he foresaw that the revenues of the church would be despoiled, he charged him to take no part in a sacrilege which would certainly be followed by the cnrse of Heaven. He shed tears over the untimely fate of Wandesford, whom he had entrusted with the care of his government, and the protection ofhis family, and who, on learning the dangers of his friend and patron, had fallen a victim to grief and despair. In a parking letter to his wife, he endeavoured to support her courage; and expressed a hope, that his successor, lord Dillofy would behave with tenderness to her and her orphans. 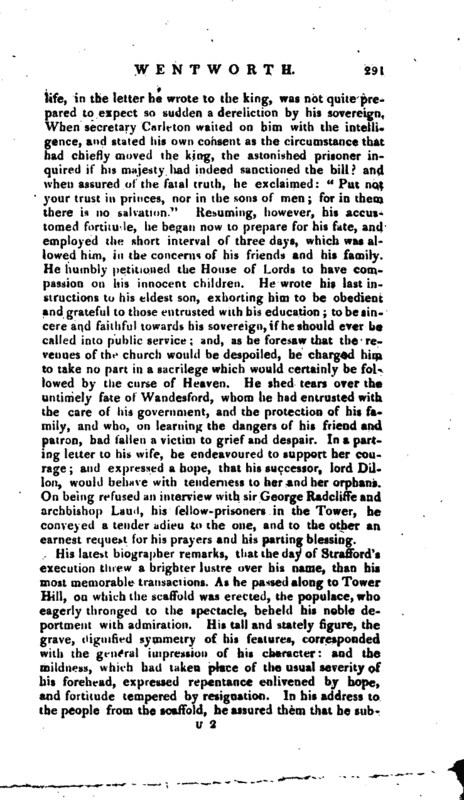 On being refused an interview with sir George Radcliffe and archbishop Laud, his fellow-prisoners in the Tower, he conveyed a tender adieu to the one, and to the other an earnest request for his prayers and his parting blessing. His latest biographer remarks, that the day of Stratford’s execution tnrew a brighter lustre over his name, than his most memorable transactions. As he.passed along to Towel Hill, on which the scaffold was erected, the populace, who eagerly thronged to the spectacle, beheld his noble deportment with admiration. His tall and stately figure, the grave, cigmfied symmetry of his features, corresponded with the general impression of his character: and the mildness-, which had taken place of the usual severity of his forehead, expressed repentance enlivened by hope, and fortitude tempered by resignation. In his address to the people from the scaffold, he assured them that he | submilled to his sentence with perfect resignation; that freely and from his heart he forgave all the world. “I speak,” said he, “in the presence of Almighty God, before whom I stand: there is not a displeasing thought that ariseth iw me to any man.” He declared that, however his actions might have been misinterpreted, his intentions had always b^en upright: that he loved parliaments, that he was devoted to the constitution and to the church of England: that he ever considered the interests of the king and people as inseparably united; and that, living or dying, the prosperity of his country was his fondest wish. But he expressed his fears, “that the omen was bad for the intended reformation of the state, that it commenced with the shedding of innocent blood.” Having bid a last adieu to his brother and friends who attended him, and having sent a blessing to his nearer relations who were absent, “And now/' said he,” I have nigh done! -One stroke will make my wife a widow, and my dear children fatherless, deprive my poor servants of their indulgent master, and separate me from my affectionate brother and all my friends. But let God be to you and them all in all. 11 Going to disrobe, and prepare himself for the block, “I thank God,” said he, “that I am no wise afraid of death, nor am daunted with any terrors but do as cheerfully lay down my head at this time, as ever I did when going to repose.” He then stretched oat his hands as a signal to the executioner; and at one blow his head was severed from his body. His execution took place May 12, 1641, in the fortyninth year of his age. Though his death, says Hume, wa loudly demanded as a satisfaction to justice, and an atonement for the many violations of the constitution, it may be safely affirmed, that the sentence by which he fell was an enormity greater than the worst of those which his implacable enemies prosecuted with so much cruel industry. The people in their rage had totally mistaken the proper object of their resentment. All the necessities, or, more properly speaking, the difficulties with which the king had been induced to use violent expedients for raising supply, were the result of measures previous to Stafford’s favour: and if they arose from ill conduct, he at least was entirely innocent. Even those violent expedients themselves which occasioned the complaint that the constitution was subverted, had been, all of them, conducted, so far as appeared, without his counsel or assistance. And whatever his | private advice might be, this salutary maxim he failed not, often, and publicly, to inculcate in the king’s presence, that, if any inevitable necessity ever obliged the sovereign to violate the laws, this license ought to be practised with extreme reserve, and as soon as possible a just atonement be made to the constitution for any injury that it might sustain from such dangerous precedents. 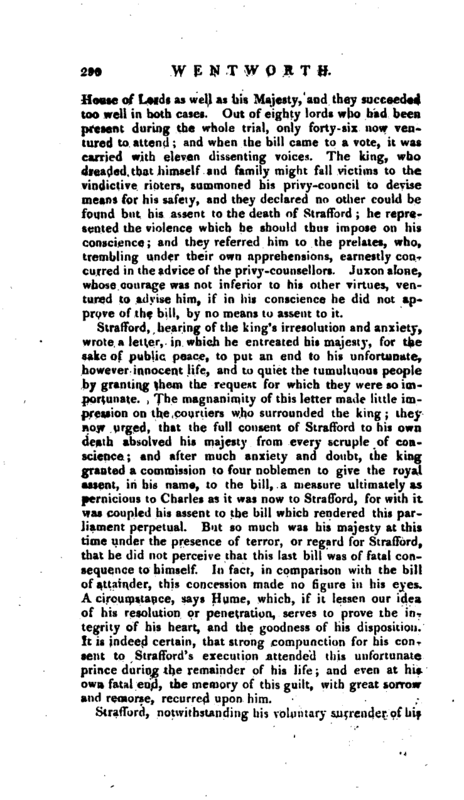 The first parliament after the Restoration reversed the bill of attainder; and even a few weeks after Stafford’s execution, this very parliament remitted to his children the more severe consequences of his sentence, as if conscious of the violence with which the prosecution had been conducted. Biog. Brit. Macdiarmid’s Lives of British Statesmen. Stratford’s Letters. Life of Radcliffe. Birch’s Lives.- Hume’s History.